This appears to be a natural event and I suspect that we are dealing with a stable rotating air mass that developed a charge from the surrounding electrified environment. This effect succeeds in increasing the stability in the same way that ball lightening is produced. A vortex could induce an electron flow that forces the mass of air to reshape as a globe. The surface of the globe develops an electron deficit that induces a glow. So far this is all guess work but it is at least a start toward a theoretical model. This phenomena may well occur worldwide and needs to be considered for repeating light events that are geographically indicated along with my slime mold conjecture. 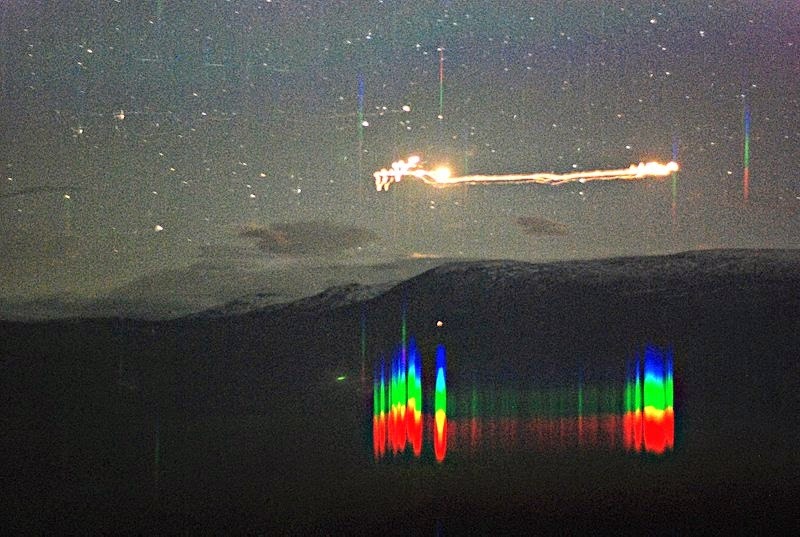 UFOs in Norway: Are the 'Hessdalen Lights' Sparks From a Giant Geological Battery? Sometimes the lights are as big as cars and can float around for up to 2 hours. Other times they zip down the valley before suddenly fading away. Then there are the blue and white flashes that come and go in the blink of an eye, and daytime sightings that look like metallic objects in the sky. It is little wonder that when they started appearing up to 20 times a week in the early 1980s, UFOlogists hailed the Hessdalen valley as a portal to other worlds and flocked there to celebrate. But for an international team that has been studying the mysterious lights since then, the valley harbours something much more exciting than flying saucers. If they can work out what it is about the place that powers such incredible light displays, it may not only help explain mysterious lights in other parts of the world, but also open up the possibility of storing energy in a radical way. It is a big if, but the team will be heading back to Hessdalen in the summer to test out a bunch of theoires on what is generating the lights. Armed with clues from recent lab studies, plus a bank of new instruments and sensors, they could find that this is the year it all starts to make sense. The small group of Italian, Norwegian and French researchers who have been working together (part-time) on the mystery for the last 14 years have have noticed a few curious things about the Hessdalen Lights: while they make no sound and don't seem to be overly hot (no evidence of burn marks where they contact trees and the ground), they do seem to sterilise the ground where they land, as there is an absence of soil microbes at areas of contact. Furthermore, the researchers have found that they sometimes get strong radar echoes "from unseen entities" even when no lights are visible. The combination of all these clues has researchers thinking that the Hessdalen Lights are a kind of plasma, formed from ionised gas. When the gas ionises, it forms "a cloud of ions and electrons which release energy in the form of light when they recombine". This light is not always in the visible spectrum though, and plasmas can be cool enough to touch. Even more interesting, plasmas are known to kill bacteria. And a plasma cloud would also account for the strange daytime sightings of 'metallic objects' flying through the sky - such objects would in fact be very dense plasma clouds beginning to emit light. However, to ionise gas usually requires temperatures around the 10,000°C mark...something like a lightning strike. Therein lies the problem: in Hessdalen the lights aren't linked to thunderstorms, and appear on sunny days and clear nights. This has researchers mystified. "There must be an energy source somewhere that has the power of a lighting strike," electrical engineer Bjorn Gitle Hauge says. "What can electrify and drive a ball of light as big as a car for several hours?" There are a number of theories. One is that strong winds whipping through the valley might create static electricity on the mountains. Another theory is they are powered by radioactivity - specifically, decay of radon in the atmosphere (though radioactivity tests have failed to find any evidence for this). One other theory is that the valley acts as a giant battery, due to its unique geology: it is literally a "valley of two halves", as the rocks on one side of the river are rich in zinc and iron, while those on the other side are rich in copper. With the possibility that the river water between has sulphur in it, researchers have asked whether the natural geology of the valley make it "a perfect battery". "To test the idea, Jader Monari (of the Institute of Radio Astronomy in Medicina, Italy) and Romano Serra (from the University of Bologna, Italy) set up a pair of rocks from opposite sides of the valley as electrodes, and dunked them in river sediment to mimic a battery. They found that a current flowed between the two. "It was possible to light a lamp," says Monari. Monari suggests that this unique geology contributes to the lights in two ways. First, it supplies the bubbles of ionised gas, formed when sulphurous fumes react with the humid air of the valley. Second, it forms electromagnetic field lines in the valley that could move the bubble around. "This electrical field creates a path that could be the 'main raod' of the lights inside the valley," he says. The amount of theories has some researchers worried though. Computer engineer Erling Strand, who began the scientific study of the lights some three decades ago with 'Project Hessdalen', says he thinks "the theories we have now are based on too few hard facts. It can damage the research." Nevertheless, the idea that the phenomena have some basis in electrical charges is supported by other observeations, such as an observed connection between the aurora and the Hessdalen lights - observers have found that they are particularly impressive during auroral displays. For those that would like to know more about the Hessdalen Lights, watch the documentary below. And of course, check out the feature in the latest issue of New Scientist.